its damaging cold weather in tow, so there's no better time to look after your skin! 1. 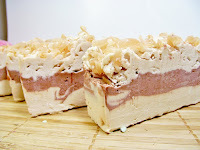 When and did you first start making soaps, and why did you decide to start selling it? Well First I started Making shampoo and because my sister starting making soap she didn't want me to do it also. About 2 years ago I feel in love with making liquid soap from scratch and moved on to cream soap. As I was searching around youtube for more tips I found these cupcake soaps and just had to try it. Now several months later I am hooked. I already sold my sisters soaps so adding my soap was a no brain er and I can't use that much soap no matter how many showers I get a day. As I started getting an inventory in my salon most everyone is eager to buy them. 2. You don't have to have made a hundred sales to be successful. Do you consider yourself successful? I do consider myself successful as I am a fairly new business and learning every step of the way. I feel very successful when I get letters from my clients telling me how one of my products helped their problem skin or cheered up a friend. Those are the days I feel I have achieved what I started Pure for. 3. Where do you do most of your crafting? Do you prefer a quiet, peaceful and tidy space, or do you usually play music when working and find that there are always scraps of this and scraps of that lying around when you start? Are you an organized worker? I consider myself an organized but must add not an organized worker..LOL I always like to start with a nice clean slate and everything in it's place but once I get started look out. It appears a bomb has gone off. I have a very small area and table I had my hubby make out of an old door when I turn around I can take literately one step to meet the wall behind me. 4 steps to one side and that is my space. It can become very cluttered quickly. This little area is in the back room of my salon and used to be where I did nails and pedicures. Now it's my lab, storage and work area. I often listen to nature music cd's like you would hear at a spa. It's calming and relaxing. Time goes by very quickly when I am in my room working. 4. Have you always had a passion for crafting? Yes ever since I was little I was a crafty person. I used to color my coloring books one page at a time and in order. I kept my crayons in immaculate condition and never let anyone use them. My Grandmother had a ceramic shop and later moved on to do Replica Dolls. The old fashion kind with fancy dresses out of porcelain. My mother always made our close and taught me so and can vegetables when we were little. I basically love making everything including jewelry. 5. What was the first thing you made? Soaps, scrubs, lip care? It's actually quite funny that I started with mineral cosmetics and moved onto lip balm. I then found some great suppliers and lots of information on lotions. The next thing I know I am spending 8 to 10 hours a day researching butters, essential oils, and everything under the sun. 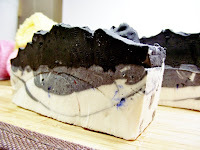 I soon moved to soaps and found it to be such a creative way to get clean. 6. What is your favorite product that you've made? And why? This is a hard question. I spend so much time developing each item and researching that they are all very important to me. I think my first facial moisturizer (Extreme) has to be my most though. From the very first try I loved it and have found many clients feel the same way. The extreme was developed for sever dry skin. Suffering from this and adult acne I have found 2 great formulas that are perfect for dry skin. You can also use it any where on your body. 7. Tell us something interesting about yourself. I secretly wish I was born Amish as they have a simple self sufficient way of life. 8. What was your favorite thing while growing up? Visiting my Grand Parents house was one of my favorite things. My sister and I used to play in all the cubby holes and basement. My Aunts and Uncles were not much older then us.We had them to play hiding seek down in pipe room as it was called. (basement) It was where my grandfather stored all his plumbing supplies. A fun maze of rooms and shelves to hind in. I loved painting ceramic cookies with my grandmother and made Christmas decorations that I still have today. 9. What's the stupidest thing you've ever done, and do you regret it? Oh I have done a lot of stupid stuff but....One thing I wish I had done when I first started this was to really think about my business name. I first started with Pony Dust cosmetics. Although the business was ok it really only got the attention of young girls. I changed the name this past April and if anyone tells you a name doesn't make a difference they are wrong. It was a lot of work to change everything to the new name but I do not regret that. 10. What did you really want to be when you grow up? Are you still aspiring to do it or something beyond your crafting? Why? Oh when I was a kid all I wanted was to be a horse trainer. I did get to train a few horses in my life but never as a real job. Now I am just working on what I want to be when I grow up. Perhaps it's mid life crisis not sure. It would be great to get Pure Bath & Beauty to become my full time job and pay the bills so I can just enjoy my horses I have. Visit Lynda's wonderful Etsy shop, PureBathandBeauty, and have a look around. She also has a blog, a Facebook Page, and a jewellery shop! Such a great feature! Love her shop and soaps. They are so creative! Such beautiful soaps! I absolutely love the cupcake ones, adorable!! !